MASS Gallery impacts the creative culture of Austin by cultivating a physical space for open engagement with a multiplicity of interests and acts of art making. 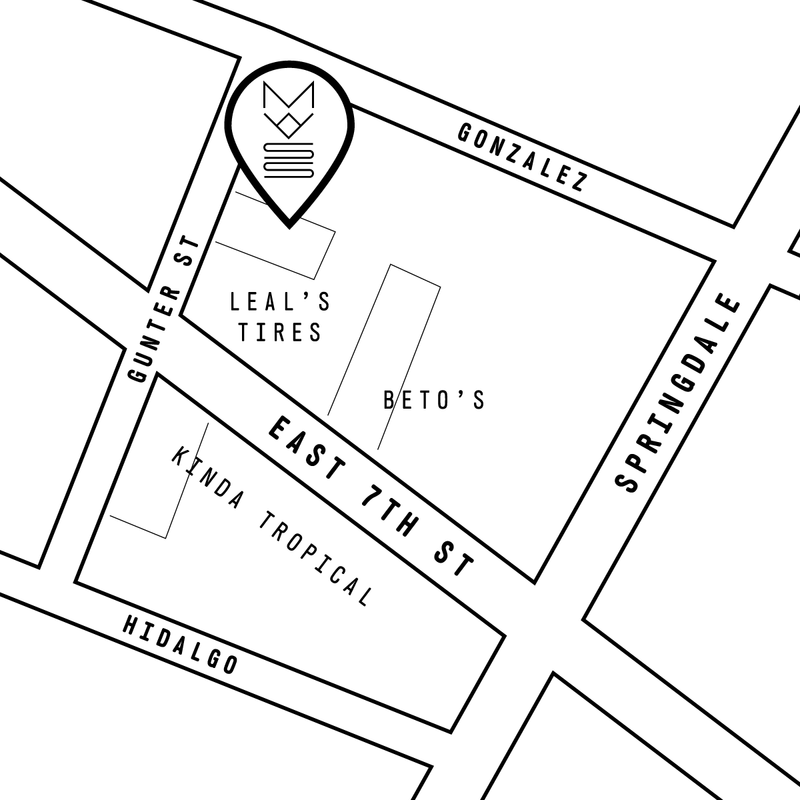 Founded in 2006, MASS is a collectively run nonprofit gallery and project space based in Austin, Texas. Consisting of a cast culled from Austin’s rich community of artists, writers, musicians and educators, MASS members jointly contribute to the daily operations and strategic planning of exhibitions, programming and events. From 2006 to 2010 MASS existed as part of the Blue Theater complex, behind what is now Big Medium at Canopy and adjacent to the current Museum of Human Achievement. During this period, MASS presented more than forty exhibitions and indescribable events, establishing its reputation as an art space with a true sense of curiosity, always amenable to the risk of providing its space and energy in support of the unknown. MASS’s stint at the Blue Theater was characterized by large scale installations that dramatically transformed the space, notably House Painting by Erin Curtis, Stalemate of the Boozefox, and Panopticon by Dustin Kilgore. MASS also became an associated venue and partner with Austin art events like Fusebox, EAST and The Texas Biennial. Between 2010 and 2013, MASS utilized a two year nomadic period to create public art projects and pop-up exhibitions around town. MASS teamed up with CoLab to mount 2 exhibitions: Monolith Pass by Anthony Garza and Vortexas Brainsaw Massacre, a haunted house/installation staged by the MASS staff. We also did the Totally Wreckshow at Big Medium and a group show, Methods of Entanglement at the UT ACES building. In November 2013, MASS established itself in its new location within the 507 Calles Street complex, consisting of a 1,500-square foot gallery space, five large work studios and a unique retail space. After 5 years at Calles St MASS has relocated into a standalone structure at 705 Gunter St.
Erin Gentry is a native of Mexico, was raised in the United States, and has been living and working in Austin since the late 1990s. Erin has extensive professional experience in youthwork, bilingual education, and program design and project management, and has been involved in the creation and development of several small non-profit organizations, where she specialized in strategic planning, organizational development, and meeting facilitation. Her nationally recognized work for Arthouse at the Jones Center’s youth education programs impacted the lives of hundreds of young artists and educators. Erin holds a bachelor’s degree in Liberal Studies from St. Edward’s University, in Austin, TX, and a master’s degree in American Culture Studies from Bowling Green State University in Bowling Green, Ohio, where she wrote about intersections of gender, contemporary art, and urban space. She has also completed graduate coursework in museum studies and information studies. She has been an active member of MASS Gallery since 2011. Aaron Dubrow is a founding member of MASS and a science writer at The University of Texas at Austin’s Texas Advanced Computing Center (TACC). He received a BA in English from Williams College and an MA in Journalism from UT Austin. He has attended residencies at Skowhegan, the National Evolutionary Synthesis Center, the Kavli Center for Theoretical Physics and the National Center for atmospheric Research, and recently finished a three-year stint at the National Science Foundation in D.C. Aaron has curated several shows for MASS, including Wally, Methods of Entanglement, Ping Pong, Systems of Growth and Decay, and 20MB — several of which touched on issues of technology and science. He also organized the Alley Cat Project (funded by a grant from the Idea Fund), Frame, a day of performances, talks and art events in collaboration with other non-profit art spaces (supported by the Texas Commission on the Arts), and Technovisual: Art in the Age of Code at the American Association for the Advancement of Science. Andrea Calo is a freelance architectural and interiors photographer living in Austin, TX. She grew up on the edge of urban sprawl in Phoenix, Arizona, and received her BFA in Photography from the Herberger Institute of Design and the Arts at Arizona State University in 2009. She relocated to Austin in 2012, and in 2014 founded Lower Left, a garage gallery space. With a mission to promote collaboration between local artists, Lower Left housed exhibitions in a South Austin garage, and later joined the arts and education non-profit, Studium. Now on hiatus, Lower Left inspired Andrea to join MASS Gallery in 2017, in an effort to continue facilitating art and collaboration as an active member of the community in Austin. Ted Carey is an improv sculptor and abstract turntablist currently living in Austin, TX. Michelle Devereux is an artist born and raised in Dallas, Texas and has been living and working in Austin since 2005. She received her Bachelor of Arts Degree from Bard College in 2004. She currently works at an Austin-based chainstitch company known as Fort Lonesome. Her performances, installations, videos, and drawings have been shown locally at Monofonus Press, Mass Gallery, Arthouse at the Jones Center, Co-Lab, Domy Books, Okay Mountain, El Cosmico, and Museum of Human Achievement. Other notable shows include a two person show with Matt Furie at New Image Art Gallery in Los Angeles, in addition to a pizza themed group show at Marlborough Gallery in Chelsea. Her recent body of work centers mostly on the media of colored pencil drawings mixed airbrush. Brooke Johnson is an artist living and working in Austin, Texas. She is expected to graduate in 2019 with a BFA in Studio Art, a BA in Art History, and a Bridging Disciplines Program Certificate in Museum Studies from the University of Texas at Austin. Her performance and lens-based art practice focuses primarily on the environment, animals, and representations of the natural world within science and natural history museums. Brooke is a member of Mass Gallery, The Museum of Human Achievement’s IRL @MoHA, and Fleet Performance Collective. She has exhibited and performed in multiple exhibitions within Austin, both individually and as a member of Fleet Performance Collective. Let your generous nature be known by making a fully tax-deductible direct donation to MASS Gallery today! Your generosity places you among a league of visionary donors, aids in the creation of new artwork — experimental and progressive — and contributes to an exuberant line-up of film screenings, musical performances, opening receptions, and community outreach activities. Your gift not only promotes contemporary arts programming not seen elsewhere in Austin, but furthers the creation of a culturally-rich community for all. MASScot is our annual membership program for donors and sponsors. Become a MASScot by choosing from one of the following tiers below that best fits you and your interests. It takes a community to support a collective. Help us achieve financial sustainability and keep our organization alive!